DIY: Upcycle Flower Pots Into Gardening Kit Gifts! Mother's Day is quickly approaching and now is the perfect time to gather your children to make fun gifts for mom and grandma. My son wanted to have creative control over the gifts that we will be giving to his grandmothers this year for Mother's Day. Both of them enjoy spending time outdoors, so he thought that giving them the gift of gardening would be apropos. This project is an easy undertaking, and when all is said and done, you have a cheery gift for kids to give any special lady in their lives for Mother's Day. You most likely already have all of the supplies you need to make this offering in your garage and craft closet. 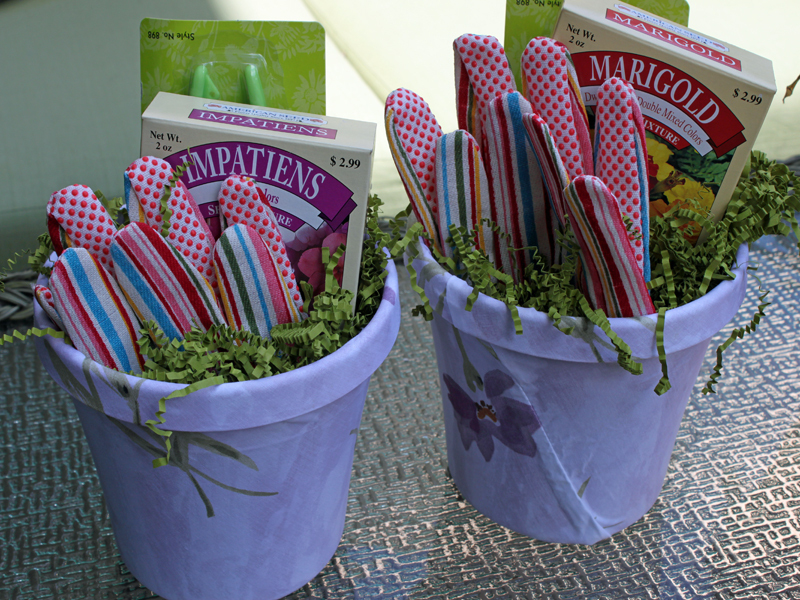 Read on to learn how to make these sweet upcycled flower pot gardening kits! gardening gloves, pruning shears, seeds etc. 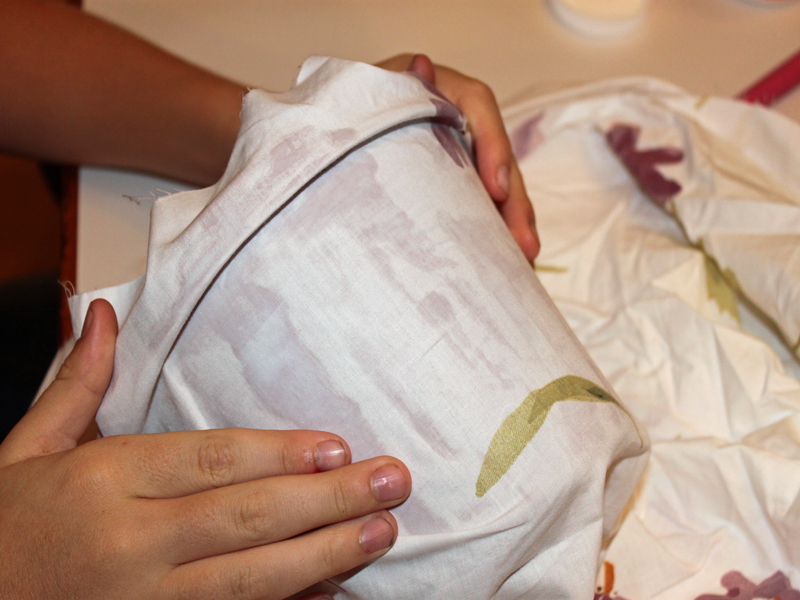 Grab your fabric and pot and measure to determine the amount of fabric that you will need to cover each of the pots. Then, use the scissors to cut the fabric as close as you can to the correct size without going too small. 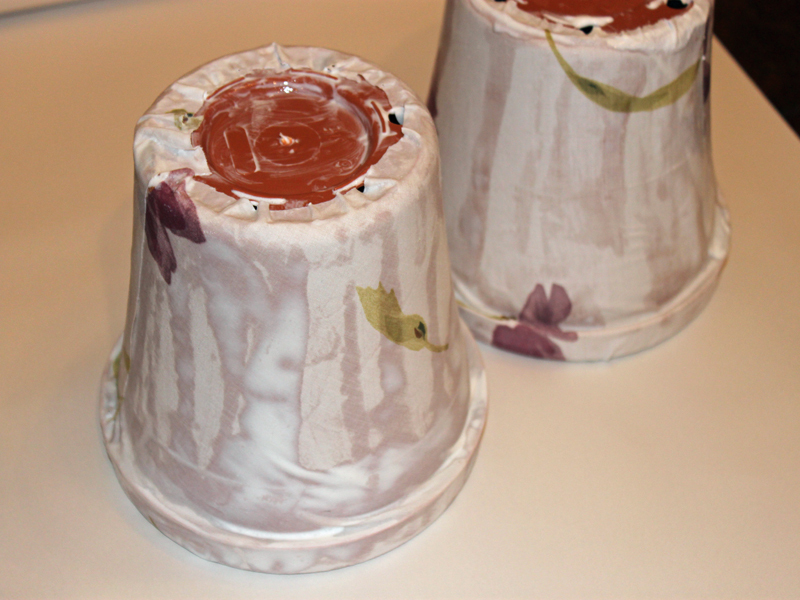 Remember you need the fabric to cover the entire outside and part of the top and bottom of each pot. You can also opt to use any variety of paper cut-outs you’d like, and decoupage your flower pot with a collage of images. 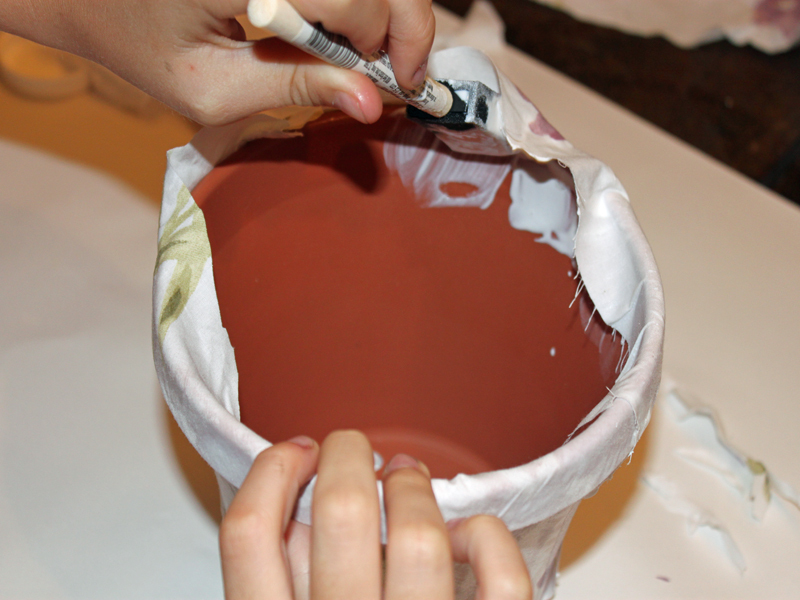 We started by adding a layer of Mod Podge to one side of the pot, then adhering the fabric. We would hold it in place for a couple of minutes, until it started to really stick and then move on to the next section, until the entire outside of the pot was covered in fabric. We then rotated the pot and straightened out any remaining wrinkles. Use the scissors to cut off the excess fabric around the seam, the top and the bottom of the pot. 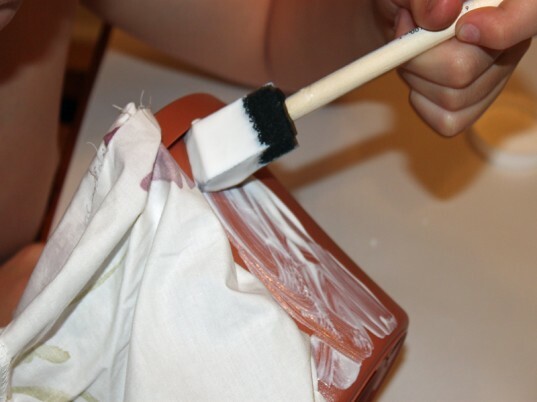 Leave just enough fabric to tuck under and glue so you have a clean edge all around the pots. Then, tuck and glue the edges. We let our pots dry overnight. You’ll want to allow them enough time to dry completely. Make sure to position them somewhere that they won’t stick to anything. 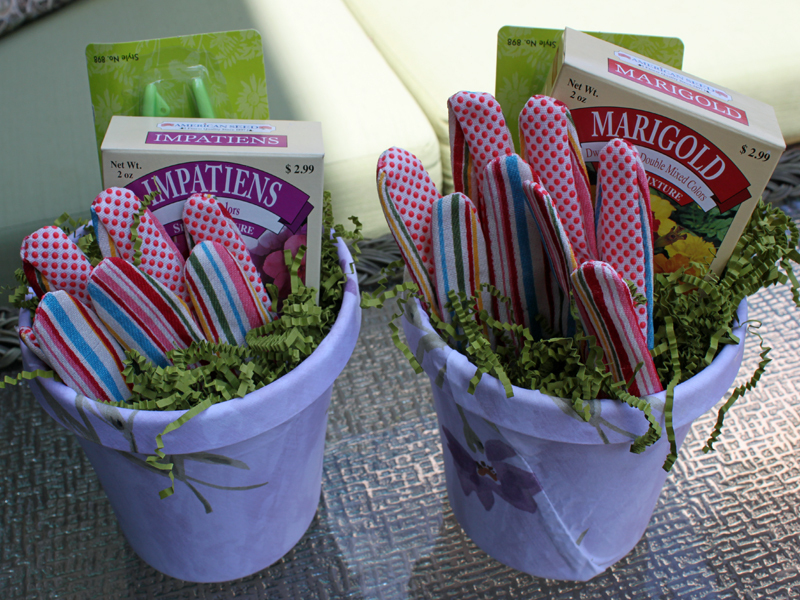 We lined the flower pots with green packing material that came in a box that was delivered to our home, and then stuffed each of the pots with a pair of gardening gloves, pruning shears and a box of flowers. My son is super excited to give his grandmothers these upcycled flower pot gardening kit gifts that he created all by himself. Really its a new idea, i like this idea, i try to change my all flower pots, for looking different. old pots fabric scraps Mod Podge paint brush scissors gardening gloves, pruning shears, seeds etc. 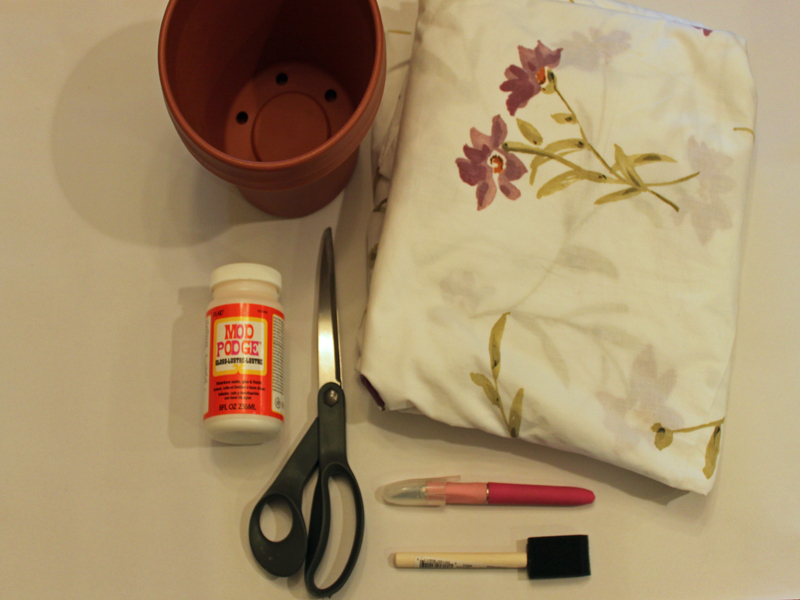 Grab your fabric and pot and measure to determine the amount of fabric that you will need to cover each of the pots. 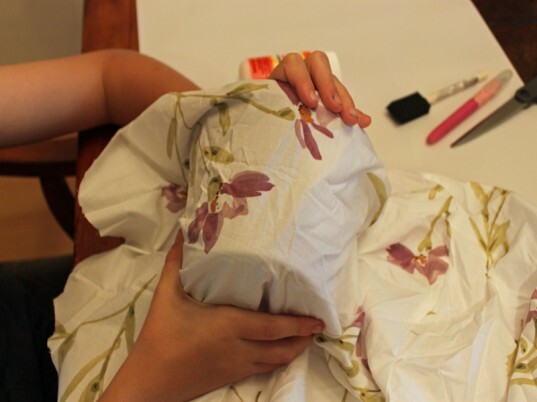 Then, use the scissors to cut the fabric as close as you can to the correct size without going too small. Remember you need the fabric to cover the entire outside and part of the top and bottom of each pot. You can also opt to use any variety of paper cut-outs you'd like, and decoupage your flower pot with a collage of images. We let our pots dry overnight. You'll want to allow them enough time to dry completely. Make sure to position them somewhere that they won't stick to anything. My son is super excited to give his grandmother's these fun flower pots full of gardening gifts that he created all by himself.